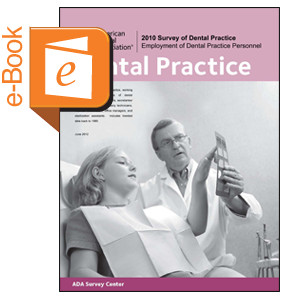 This report includes data on the prevalence in the private practice, working hours, and hourly wages of dental hygienists, chairside assistants, secretaries/receptionists, dental laboratory technicians, financial coordinators, office managers, and sterilization assistants. Includes trended data back to 1990. This is a downloadable report, which is also available free of charge to ADA members at www.ada.org/freereports .